Yesterday the funniest thing happened, I was sitting down with a cup of coffee for 5 minutes and I decided to have a sneaky treat. 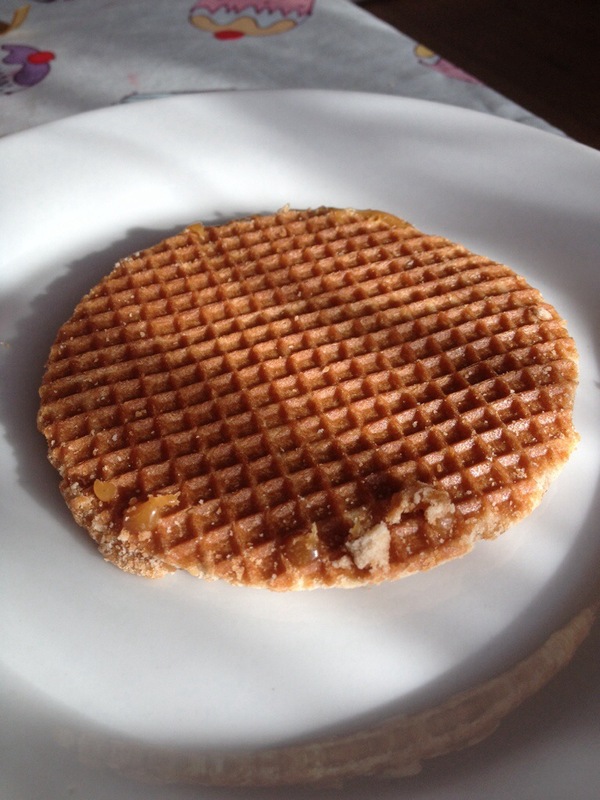 I just love these yummy caramel waffles and have found that I can buy the in Aldi at less than half the price of some of the other places that sell them . I was just tucking in to my moment of self indulgence when I heard Charlie’s little voice say “ooh, I would like to try some of that mummy!” When I got over the initial shock I handed him my treat, he took a really small nibble of the edge and declared that he liked it, and that he would be eating the rest of it. So it was goodbye caramel waffle and hello food thief. My husband remarked how it was just like having a one year old who suddenly became interested in pinching his parents food. Charlie has never done that before and so missed out completely on that eating milestone. I remember when he was small telling the professionals “he doesn’t steal food from my plate” I wonder if they understood that this is something kids are supposed to do? 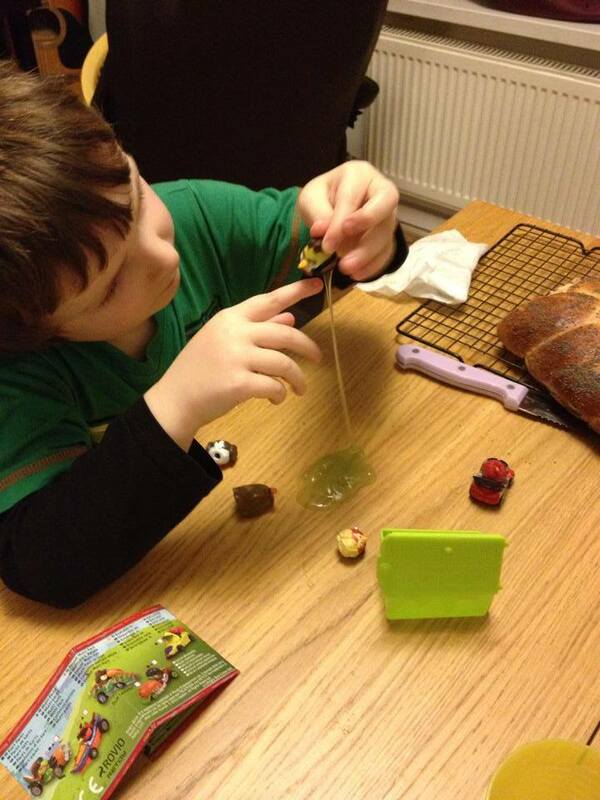 Charlie has made great progress this month trying out different types of breads. Last week my lovely friend bought him a new type of mini gingerbread man which he asked if he could try this morning, he enjoyed the packet he had and has taken another 2 packets to school with him. Last week his teacher told me that he had taken the class to the park to feed the ducks, he gave all the kids 50:50 bread to use, but instead of feeding the ducks all the kids including Charlie ate the bread and the poor ducks went without. 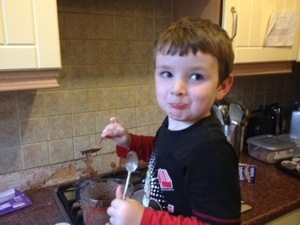 So onwards and upwards…Let hope he keeps going with his new found interest in other people’s food. I wanted to write this post because I have come across a few parents recently both in real life and on the internet who are in the process of deciding on a school for their special kids. I see fear in their eyes and hear it in their voices, and I know, I really know because I was there too, no so long ago. In a place where you have to make a decision with so very many unknowns, and such huge potential consequences. There is so little known in the wider community about what special school are like on the inside, and I keep seeing that for those who don’t have children in special-Ed there seems to be a fear of these schools, at best that these school will hold our kids back or at worst an impression that they are like 19th century institutions. Choosing the right school for any child is a tough decision, there are so many variables and unknowns, and every school and every child is different and has different needs. I admit that the idea of not sending Charlie to the same school as his sister was extremely painful for me. Last spring during a very well managed ‘transition’ we went to look at Charlie’s current school 5 times on the first 3 occasions I cried. This wasn’t what I imagined our lives would look like, it wasn’t the dream I had of my kids being in the same school, with their wonderful little cousins, growing up together sharing experiences and teachers. This wasn’t at all how I imagined things would turn out. But, at some point I had to get beyond myself and my dreams and see that what was best for my kids, might not look like my dream. There is a strong push to keep our special kids in mainstream education for as long as possible. Some children really are better off in mainstream education, in large classes, and busy lunch rooms, with lots of opportunities for interactions with lots of different people. And some schools can make inclusion work really well, others can’t and the kids suffer as a result. I’m often asked, couldn’t he cope in mainstream? I’m sure he could ‘cope’ but who wants to cope? school isn’t about coping its about living and learning and making friends and having fun. 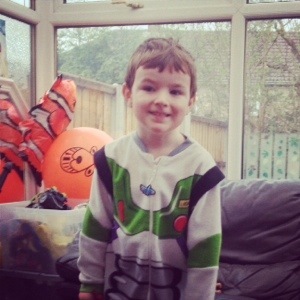 For us, even though Charlie had enjoyed his time in mainstream nursery, I had to think long and hard about how much energy I had left in me to fight for help for him in school. How much energy did I have to be the one supporting the school and helping them to understand his needs. And so as painful as it was we took a leap into the unknown and accepted the place we had been offered in an assessment unit of a special school. 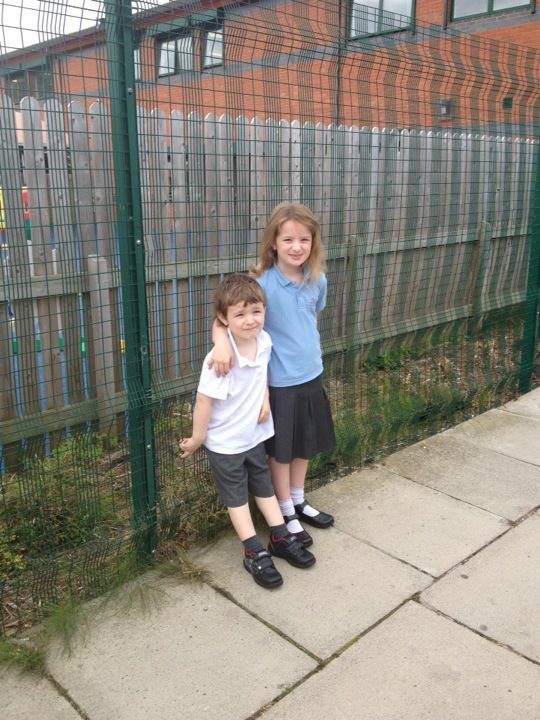 Charlie’s term dates are longer than Lillie’s, she is a little star, and on his first day, even though she wouldn’t be going back to school for a whole week, in a show of solidarity and to help him understand what was happening she got up and put her own school uniform on. 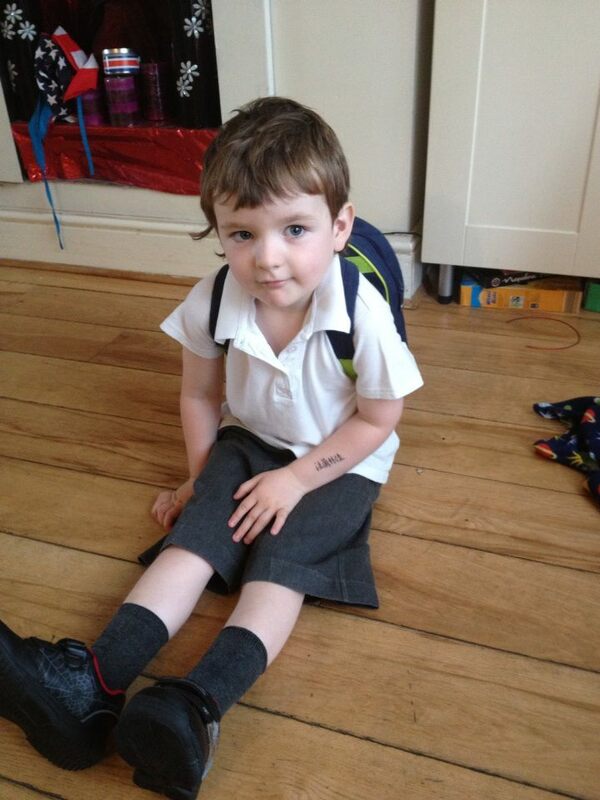 We all took him and dropped him off for his first day at his new school. 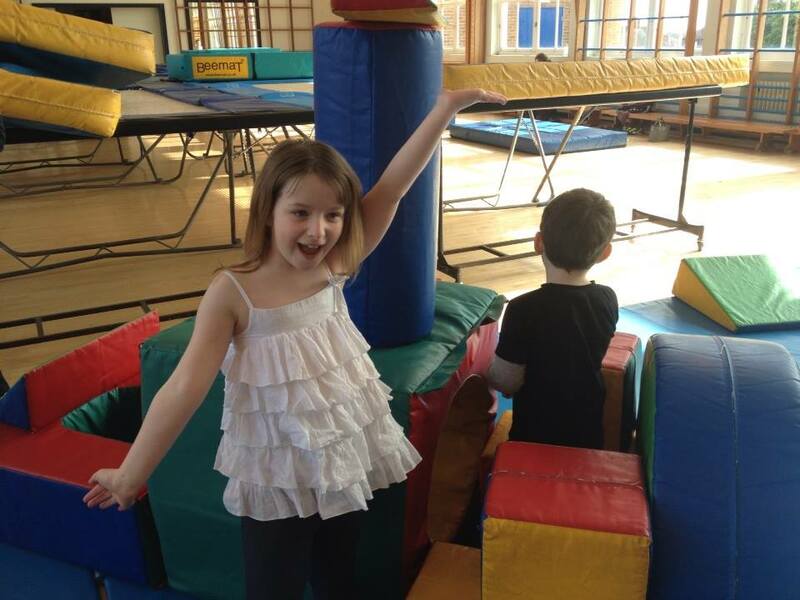 Charlie had only been there a few days when the head called, to tell me that she was “interested in Charlie’s sensory processing disorder” and that she had organised for a local specialist OT to come into the school to train the whole staff on sensory processing! I cannot even put into words how different this felt. For years we had been in a place where even the special needs coordinator would tell me that because Charlie was well behaved and compliant had no difficulties. She once said ” you will never get a diagnosis” and would tell me that sensory processing disorder is not a recognised condition, that there were no funds for additional support even for children with a diagnosis of ASD or that other children needed it more. 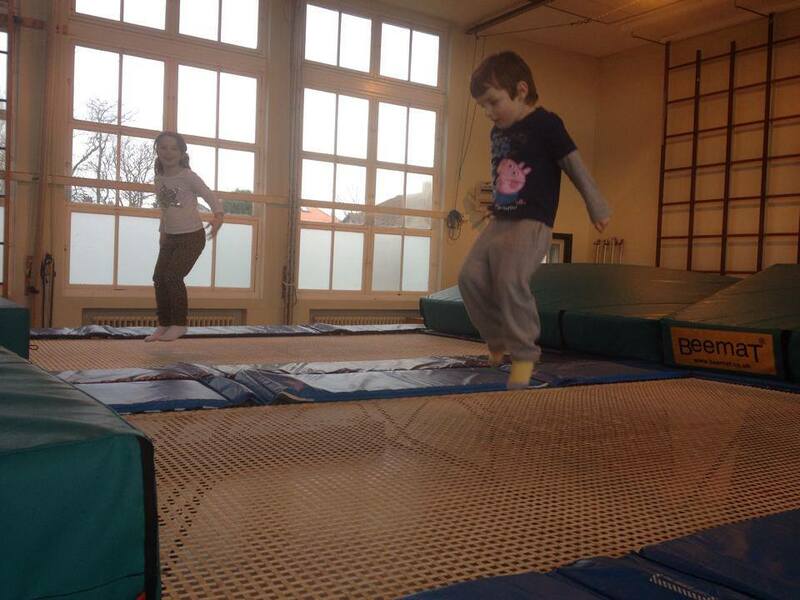 This school is as different as night is from day, they have taken his sensory diet and are using it enthusiastically. 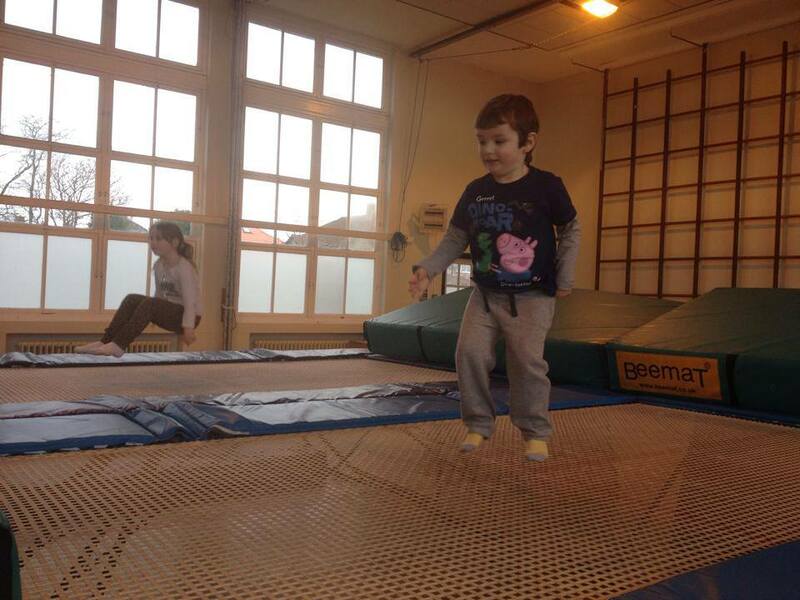 They bought him a mini trampoline, out of school funds, to use in the classroom. They have agreed to give him protected lunch times where they will only offer his his safe foods, and one to one support with exploring new foods at other times. 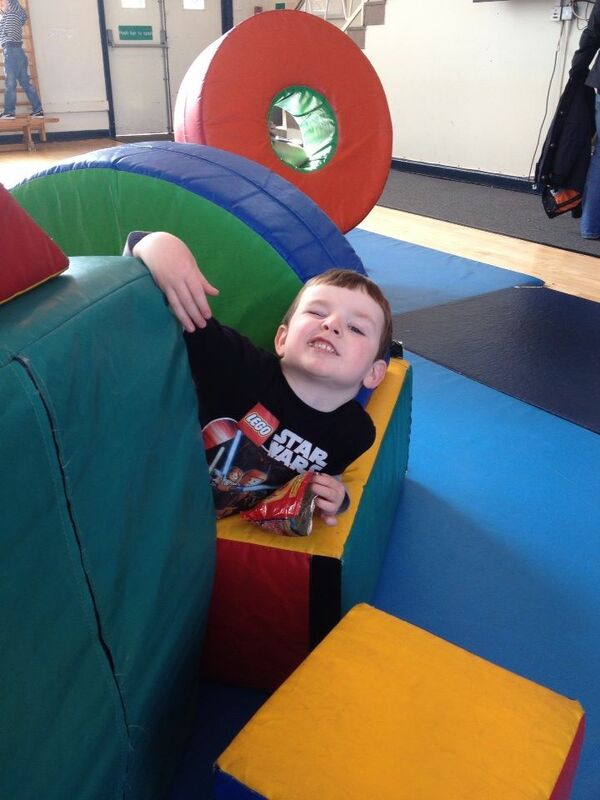 Charlie has been in the assessment unit for 6 months now, it is managed by a special school and run just like one. The have small class sizes, and helpful friendly staff. 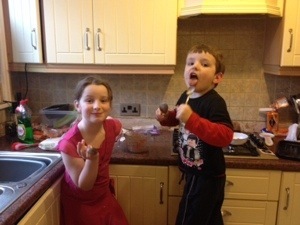 I have to say that although hard accepting a place there was one of the best decisions we have ever made. Charlie is making great progress, both academically and socially he loves the school and he has lots of friends. A few weeks ago I was struggling with something else, and to get out of myself I decided to write to Charlie’s school to thank them for everything that they have done to help and support I am sharing this letter, because I wanted to help anyone who is considering special ed to be a little less fearful about what the future may hold. I just wanted to take a minute to write and say thank you so much for everything that you are doing to help and support our son. To let you know how happy he is at your school, and how this is having such a positive impact on our family. Before we came to this school we had become accustomed to having to fight tooth and nail for every little tiny accommodation, we were given no extra support, and even the people who were supposed to be on our side would let us down failing to turn up for important meetings, not keeping to written agreements they had made with us and not returning phone calls. We often felt that nobody listened to our concerns or took them seriously. I know many many other parents who are still in having these kinds of problems and I have to say that the staff at this school make a very refreshing change to this situation. Each member of staff that we have met has always treated us fairly, they have done their very best to listen to our concerns and help us. The staff are relaxed and competent, friendly and helpful. They always have time to stop and talk with the kids and parents. They never come across as defensive, too busy or uncaring. The children in the school reflect this positive attitude, and our son has made great progress in many areas of his development since joining you. He has become much more confident and his ability to communicate has improved significantly. It is a joy to hear him talk about “all his friends”. He loves going into school and I know that he feels safe and happy in there and he is learning lots of new things everyday. We are grateful for the fact that the teachers and staff treat all of the children as individuals, and that even though there are children in the school with far greater needs than our son they never dismiss my concern’s or his needs as being insignificant. This is especially important to us because his disability is kind of hidden and not obvious when you first meet him and we are regularly faced with disbelieving uncaring attitudes. We want to say thank you for the efforts you have made to both understand and accommodate his sensory processing difficulties. For the training you organised for the staff, the equipment you have provided, and the extra support you have given him with his eating. We are grateful to Mrs K who is supporting us in finding a suitable place for our son to continue his education when his time in the assessment’ unit comes to an end. We hope that when he does eventually move on at some point in the future that he will be as happy as he is here and will receive the same high quality care and teaching, although I have to say that this school will be a very hard act for any other school to follow. We want to say how we are both thankful and relieved that Mrs K helped us to finally see an educational psychologist, after 2 years of us banging on doors and getting no answer, having the report from the educational psychologist is like having a missing puzzle piece that we have been desperate to find. We are also grateful to Mr D, Charlie’s teacher, for the love and care he shows the kids, for all the hard work and attention he put into their education. It is a delight to see how he engages with the children and how much they love him. 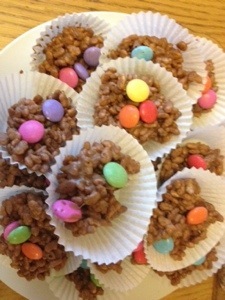 It is great that Charlie has such a positive male role model during his early years education. We have found this caring attitude from the school staff extends even outside of school hours. One night we were struggling to find ways to encourage Charlie to eat in Mcdonalds. When Mrs H one of the teachers from blue group arrived in the restaurant with her family, she very graciously took time out of her family meal to sit with Charlie and encourage him. It is hard to put into words how much something like this which may seem small, actually really matters. Please be encouraged that you are doing a very important job and in our eyes you are doing it very well. Whilst we know that this is what you are paid to do we also know that positive attitudes, love, care and understanding are things that money cannot buy. Being part of this school is a huge blessing to our son and to our whole family. I have started trying to write this post on many occasions, and I keep getting stuck and it never gets finished, but today I am going to try again as its something that I have really been battling with over the last year, but I finally feel like the tide is turning. I do feel like I am making some progress, like I am beginning to win the never ending screen time war, and have finally managed to get to a point where the kids know I’m not joking when I tell them they have reached their limit and they have to turn it off. 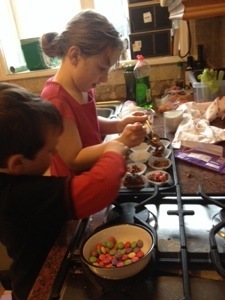 Over the last few weeks we have finally established some very clear limits, and although the kids think I am being mean I know it will be well worth it in the end. There is just so much more to do with your life and so much more to experience. When I was a kid there was lots of time to be bored, which meant that there was also lots of time to be creative and generally get into trouble. If we were lucky there was about 1.5 hours a day of kids TV programming and Saturday morning TV was a major treat. But if you missed it you missed it and for most of the rest of the time there wasn’t really anything on TV to entertain kids. Although I do remember watching lots of documentaries and quiz shows with my dad. I loved QED and blue planet, and I think some of my love for science was born at that time. There were also no other electronic screens to move onto when the TV was off. No computer, no phone, no ipad and very few trips to the cinema. I can’t even imagine what it must be like to be a child with a brain that is developing now here in the 21st century when there is never ever the need to be bored. Our kids can literally be entertained 24 hours a day by a wide variety of electronic games, gadgets and screens, there is endless variety, and they are portable, in the car, in the church, in the shops there is literally nowhere where a child cannot sit and play with an electronic device. For as long as I can remember I have been working deliberately to reduce (or more accurately to stem the increase in) the hours that our kids spend using screens. It is super hard, I mean its like a never ending battle like shovelling snow in a blizzard and its one war that I never though I would be fighting. Over the last year since I have been reading more about sensory integration, and neuro-development it has become clear to me that no matter how hard this battle is it is one which I must keep on fighting. Recently I met a mother who said that she had been told that because her son had autism that she should allow him to use the ipad whenever he wanted for as long as he wanted, because it was calming and a good way for him to zone out when the world became too stressful. Whilst I whole heartedly agree that this is a great reason to use an ipad, and it can be very helpful for when our kids need a distraction when things are stressful, I really couldn’t think of anything worse than completely unlimited use. 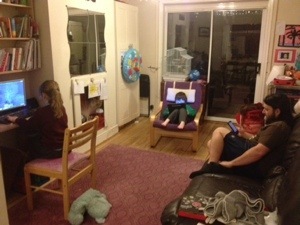 If I let my kids do this then they would literally spend all day every day attached to the device. They dont even have to come off it to eat or use the bathroom, I have even had requests from the to be able to watch films on it while they have a bath….Errm NO! I have to say that the ipad has been a God send for us when Charlie cant cope with so much sensory input, a long noisy church service or a family meal in a restaurant, but to allow him to have unlimited use of it just seems like madness. Often Charlie wakes up and literally the first words out of his mouth are “I haven’t had any screen time yet, can I have the ipad now?” I have heard lots of “it’s not fair” and “we are the only kids who cant have…” But they are slowly accepting the rules and things are changing some mornings now Charlie even wakes up and asks for toys. When they get home from school they know that they can have only one hour on their choice of screen, and there are rules about having homework done first and no screens during meal times. I was taking a call from my manager when they arrived home tonight and I was so proud of them when no one asked for a screen and this is how I found them when I finished the call. 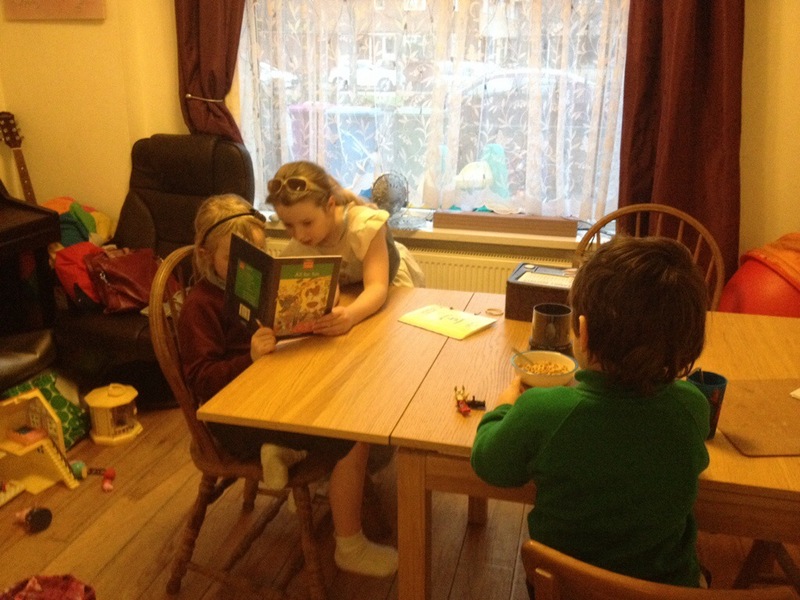 Their cousin was visiting and Lillie had even managed to offer to help her with her reading homework. Unfortunately our first adventure with funny blue bird has not been so much fun. 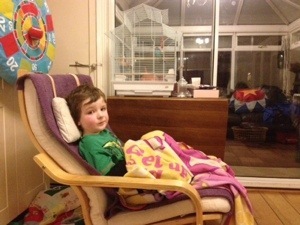 Poor Charlie woke up yesterday morning with a high temperature and a cough and so was home sick from school making sure that the budgie doesn’t get too lonely on his first day. 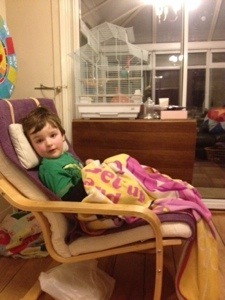 I feel so sad for my little boy who is sick with a cough and a raised temperature but wont take any medicine to help and doesn’t complain about it either, just sits in the chair with big sad eyes. Its hard to know how he is feeling because he doesn’t complain at all, he never ever tells you that he is feeling ill, and because of this sometimes I wonder if he has been ill and I could have missed it completely. He wont take and medicine or health foods to strengthen his body or make him feel more comfortable. This is the part of selective eating / ASD that I hate more than any other. The part where he cannot be bribed or manipulated or forced to take the medicine, he is so stubborn and as soon as he sees it coming just clamps his mouth closed. Maybe it’s unfair to say that he is stubborn, I am sure that if he could choose not to fear new things and not to have such severe sensory issues around eating that he would much rather take the medicine and feel better for it. He will sometimes eat sweet foods like gummies but he doesn’t see them as a treat or reward, he hasn’t eaten much at all today only some crackers and some tortilla chips. This has happened before, the first time was terrifying, he must have been about 2 years old when his temperature went up to over 40 degrees, we called NHS direct and while the nurse there reassured us, they could only advise on ways to keep him cool. Thank God for Internet forums full of mum’s with children with similar difficulties who are able to give support and practical advice. One mum shared that she keeps a stock of Paracetamol suppositories in her house, just in case of emergency. From that day on so did we, and although we haven’t had to use them yet its reassuring to know that there is always a plan B. Warning this one is going to be a tearjerker. I am writing this because I need to process what happened and tell our story, in the hope that it will all make sense one day. I have often wondered if prenatal stress causes some of the difficulties Charlie faces in living with ASD and SPD. If it is totally random, completely genetic, or a combination of millions of factors. I wonder if stress caused to the parents whilst the babies tiny brain is developing can cause or at least contribute to these things. I have searched the internet for research papers in this area and found very little conclusive evidence to sway me in either direction. Maybe the stress we went through in the pregnancy was simply bad timing or maybe it wasn’t so much the cause of the problems but Gods way of preparing my heart to receive a child with additional needs. Who knows, maybe these things remain hidden from our understanding for a reason. Both of our pregnancies were planned and we were very blessed to have been able to get pregnant within a few months of deciding that the time was right. During my first pregnancy I was child free and so able to look after myself a little more easily, I could sleep when I needed to even if it was the middle of the day. We were both working and our home was small and affordable. Apart from me being generally hormonal, grumpy, very large and extremely uncomfortable things were fairly straight forward. Unfortunately mid way through the pregnancy we found out the my dad had terminal lung cancer, this was really tough in many ways, I desperately wanted him to get better or at least to be well for long enough to meet our little one, but unfortunately his body was not strong enough to fight the cancer this time. He had already survived lung cancer 10 years before but that had resulted in him having one of his lungs removed. The intervening years had been a really positive time for the whole family, like a second chance at life for him, and an opportunity for him to rebuild some of the relationships that he had missed out on through years of working long hours on a factory shop floor. But the first cancer had left his body to weak to hold on to life, as the pregnancy came to an end so did his time with us. During the last week of the pregnancy as I approached my due date he was beginning to lose consciousness, I prayed that he would hold on for long enough to meet his latest grandchild but it wasn’t meant to be. On the night of my due date I was booked into the hospital for an induction. We had been in the waiting room for a few hours when we realised that there would be no bed available on the induction suite until maybe 3 or 4 am, and so we asked if we could go home and be with my family. We had only left the hospital for a few hours when my mum called to say that he his breathing had slowed and that he had passed away peacefully. So in the middle of the night we drove to my mums house and spent the rest of the early hours together. By the time the hospital did call at 5am to say that my bed was ready and I could still be induced if I wanted to I told them that things had changed and I was going to wait a little longer. Thanks to Easter weekend and May bank holiday it too almost 10 days to arrange a funeral date. Lillie stayed put both of us growing ever larger. My hands and feet were incredibly swollen, I had outgrown even my largest maternity clothes and by the day of the funeral the only shoes which would go onto my feet were my husbands work boots. The funeral was beautiful and a really special time of family closeness and support. I am sure my dad would have been proud of us especially as the meal afterwards was in a local carvery, one of the only places he enjoyed eating out at. Although the labour pains started on the morning of the funeral, Lillie finally put in an appearance 3 whole days later when she was delivered by emergency c-section. She was long and thin and managed to weigh in at an incredible 10lb 3 oz. Our pregnancy with Charlie started out in much the same way, I was large and tired and grumpy, and having a 2 year old it was more difficult to take care of myself, but that was to be expected. At our 20 week scan the radiographer was concerned that there was a small cysts developing in his brain, she asked us to come back a week later to have another scan on a better machine with a more senior member of staff. I googled the cysts and learnt that their formation was a normal part of a babies brain development and that their presence didn’t really mean very much at all. 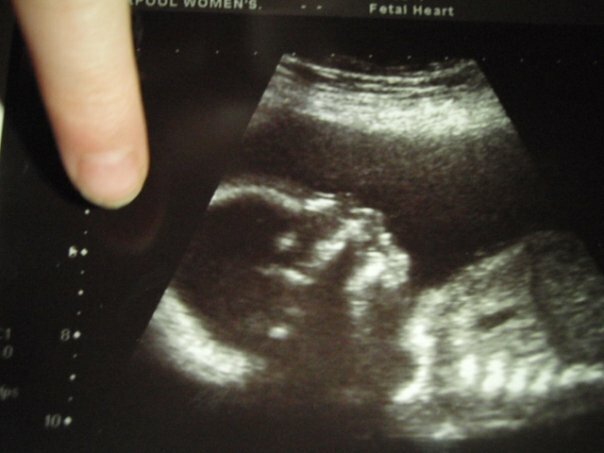 Charlie’s scan with Lillie’s finger, that night she went to bed holding the photo, of her already very much loved sibling. When we returned for the second scan, the doctor found that there were 6 of these cysts in his brain and also a calcium deposit in his heart. The doctors were very concerned, they also seemed to be quite annoyed with us that we had turned down the blood test for Down syndrome which is offered earlier on in the pregnancy. We explained that even if we found out that the baby had Down’s we would never choose to terminate so we didn’t really see the point in having the test. The doctors continued on saying that they were not just concerned about Down’s but that because of the markers they had seen on the scans, they could now tell us that Charlie had a 1 in 10 chance of having a very serious genetic condition such as Edward’s syndrome which would mean that he would be stillborn or if he did survive the birth that he would die within a few days. They felt that the wisest thing for us to do would be to have further tests, and an amniocentesis, they impressed on us that it would be important to do this immediately as the window of opportunity for a termination before 24 weeks was very short. I was shocked, we had already told them that a termination was not an option, even if the baby did turn out to have Edward’s or something similar, that we would continue with the pregnancy. We said that we may consider an amniocentesis later on in the pregnancy if we decided that we did want to have the information before birth but that we would not consider it before 24 weeks for 2 reasons, firstly in the small risk that it could cause a miscarriage and that before 24 weeks the hospital would be powerless to save the child and also we didn’t want to hear anymore about terminations. I had that horrible feeling of time standing still, the one where you can clearly remember the room and how it looked, where you were sitting, the colour and smell of the place, stupid detail like which posters were on the walls or leaflets on the tables, like it is burnt into my mind. The doctor who was with us (the one with the horrible black boots that are also burnt into my mind for some unknown reason) simply told us to enjoy the rest of our pregnancy and left the room. I would like to say that I joyfully returned to work and got on with enjoying the rest of my pregnancy and convinced myself that 10% was a really small number, that my faith carried me through without so much as a moment of worry about what it would be like to have a severely disabled child or how I would explain to Lillie that the baby that is coming to live in our house might not actually ever make it home. But that would be a lie, even with lots of faith and a strong support network of family and friends some things are still really hard to carry. Our faith does not shield us from the traumas of this life but it does give us someone to turn to when our strength is failing us. Within a few weeks of the scan a second blow came when my maternal grandfather was diagnosed with the exact same cancer that my dad had died of 3 years earlier, it was in the exact same place in his body and I was in the exact same time of my pregnancy. While I was still wondering how on earth I was going to do all this and still hold things together our landlords gave us notice that they would need us to move out of the house we were living in within a few weeks of the birth and find somewhere else to live. I honestly do not remember how I got through the weeks surrounding christmas and new year, we somehow put in a mortgage application and viewed only one house to buy. We had an amniocentesis at 34 weeks and when the results came back all clear at 36 weeks I fell apart emotionally not really understanding the weight of what I had been carrying around with me. We packed boxes ready to move house right after the birth, exchanged contracts the day before Charlie’s due date, and completed when he was less than 2 weeks old. This photo was taken the day after charlie’s birth, it is an incredibly emotional image for us and we have it blown up as a canvas on our wall. 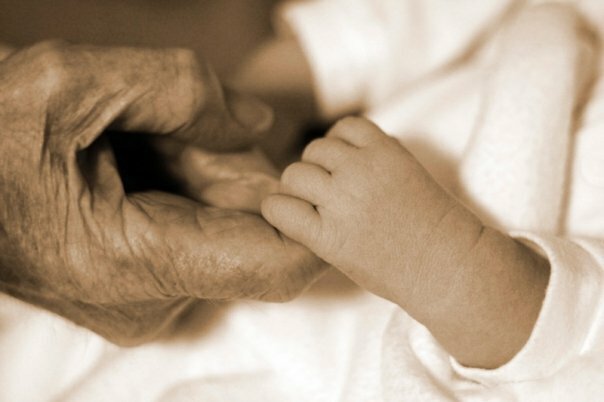 It is Charlie’s tiny new born hand holding onto his great grandfathers, for us it is a miracle that on that day they were both well enough to be able to enjoy eachothers company. It is a reminder to us of God’s faithfulness no matter what challenges we face. Although we may hold onto his hand with all our strength, like a baby instinctively grabs onto a finger, what we often don’t see is that outside of the frame of the photograph his strong arms are cradling us holding us safely and gently.